All these reality TV programmes on Saturday nights claim to have brought about a revival of shared family time with parents and siblings enjoying time together gathered around the box. It was whilst I was watching the X Factor last year that I had a yearning for some sweet treat to eat mindlessly whilst listening to the contestants ‘back stories’. I rushed into the kitchen and in a neurotic frantic fashion, threw some popping corn and sugar into a pan to rustle up an impromptu snack. I did end up with something vaguely edible that did the job required, but in the process I burnt the corn, much of which hadn’t popped properly and was left with a pan coated with black burnt caramel that took some elbow grease to put right. If it had been a contest I would definitely have been voted off that night. I decided to find out how to go about it properly and since then popcorn has become one of my favourite things. I thought I would have a go at growing popping corn this year. There is still some time to plant some if you are quick about it. I found the seeds here. As per usual, I’m lagging behind with my planting. Last week I visited my friend Shelley and her seedlings were looking positively joyous compared to mine. 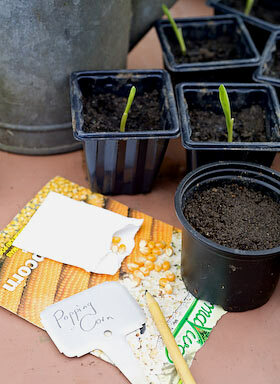 Her sweetcorn seedlings reminded me of rhythmic gymnasts dancing with streamer ribbons whereas mine have only a short pointy bit showing, as if gesturing ‘up yours’. Oh well, hopefully they will catch up in time. As corn is wind pollinated, once the seedlings get going, you need to plant them out in a grid formation (like Cheryl Cole’s backing dancers) 20-30cm apart. You can grow squashes beneath them and use their tall stick like habit as supports for climbing beans as well, to make good use of the space. Popcorn is different from sweetcorn, as the outer skin of the kernels is tougher and you leave the ears of corn on the plant to dry out. It is this tough skin that helps the corn to build up pressure when heated in the pan and that eventually explodes, as the expanding fluffy middles turn inside out. Different types of corn also need to be planted at least 250ft apart, otherwise they will cross pollinate and wont grow true. 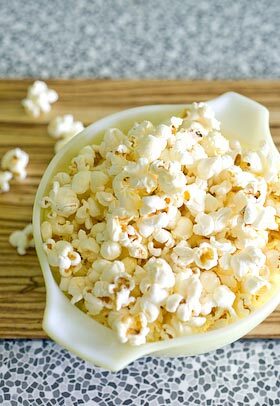 Here are a couple of ways to make popcorn that I have tried and tested and recommend that you copy. I guarantee that a bowlful at a summer party will be wolfed down no problem. The first recipe is for a classic kettle corn which is slightly sweet but salted at the same time. Made properly, it is rather too easy to eat and I do find it hard to put on the brakes if I have a bowl to myself, so be warned. I’ve now got the method down to a fine art so don’t ever burn the pan and end up with hardly any unpopped kernels (called old maids). I have used Halen Môn sea salt with vanilla for the final seasoning and it is heavenly. You can of course use plain sea salt instead but do seek out Halen Môn if you can. They make other flavoured sea salts which I intend to try on popped corn drizzled with melted butter, as well. The salt is in softish flakes so needs to be ground in a mill, bashed in a pestle and mortar or squashed under a spoon. 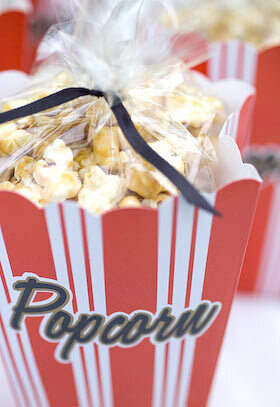 The second recipe makes a luxurious sweet caramel popcorn which requires cooking in the oven. This bit is the clincher as it turns out a lovely crunchy toffee coated popcorn with nuts unlike anything you’ll find in the shops. Have the corn and sugar ready within arms reach. Pour the oil into a large pan with a lid and place on a moderate heat. 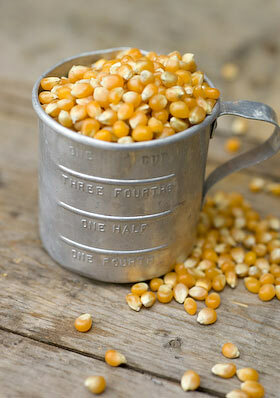 Throw in 4 corn kernels and replace the lid. Wait for the kernels to pop and when all 4 have popped tip in the corn and the sugar, replace the lid and immediately remove the pan from the heat. Count from 1 to 30 outloud (this is compulsory) then place the pan back on the heat. The kernels will begin to pop. Give the pan a shake now and again and once the frantic popping seems to be subsiding remove from the heat altogether, leave covered until the popping stops then immediately tip the popped corn into a large bowl. 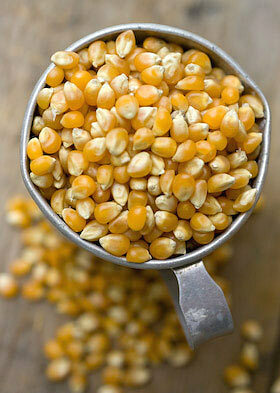 Turn the popcorn over with a spatula to separate any sticky bits and sprinkle with sea salt, coating lightly to taste. The popcorn crisps up as it cools. Pop the corn following the technique given above, but omit the sugar. Pour the popped corn into a bowl and leave to cool. Heat the oven to 130C (250F Mk2). To make the caramel, place the sugar, butter, syrup and 2 Tbsp water in a pan. Heat till melted and combined then bring to the boil and cook until the syrup reaches the hard ball stage 120C (250F) on a sugar thermometer or a drop of syrup when placed in cold water holds its shape when pushed with your finger. Remove from the heat, whisk in the vanilla extract and pour the caramel over the popcorn, turning the corn with a spatula and adding the chopped nuts at the same time. You want the corn to be evenly coated and the nuts to be evenly distributed throughout. Lightly grease 2 deep baking trays or line with baking parchment and divide the corn between them. Bake in the oven for 1 hour, turning the corn 2 or 3 times during the cooking time. Remove from the oven and leave to cool, turning the corn now and again till it is cold, crisp and the kernels are separated. Good grief, these recipes sound wonderful. I’ve done the charred caramel thing too many times and have been needing these secrets for ages. Thankyou!